How to pass: Beta Level! If you read the "Alpha Guide!" then it's a walk in the park for you. If you haven't read it yet, then you can read the guide here! From 12/22 - 1/25, continue doing the similar process you have learned to do from the Alpha Guide. Continue researching all of the tasks until a red star appears, which indicates that you have started to meet the minimum requirements to pass. 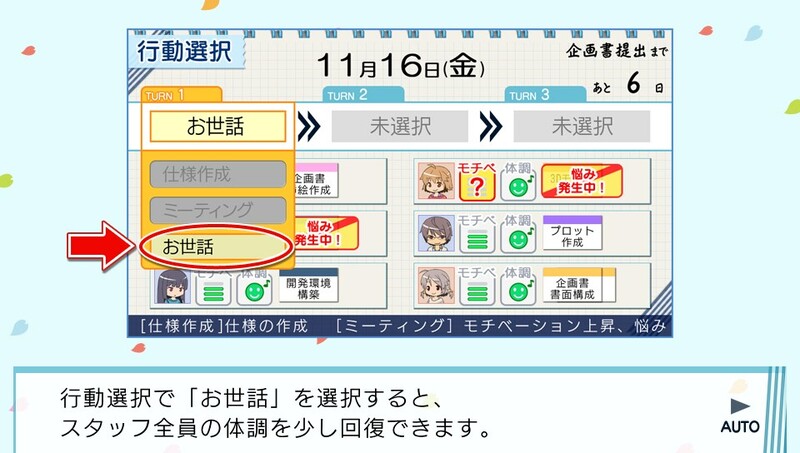 *Be careful, if you don't give your staff members some tasks after he/she finishes one, chances are, their motivation bars start decreasing down to 2! Worried that your staff members are already showing signs of being sick? 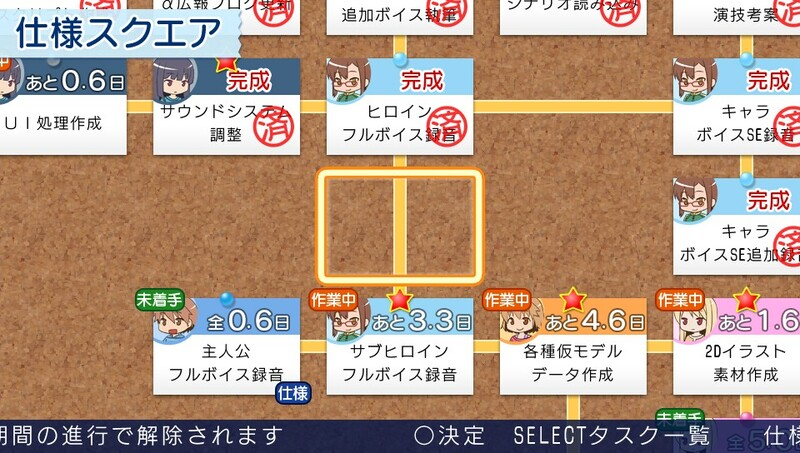 (Blue emoticon shows when you choose task, help, or clean.) You might want to understand something. Around here, you should at least have some days where you will sacrifice 2 turns for your Staff's emotions to stay green or orange. You should choose the 3rd option when you decide on what you want to work on that 1 day. The image above points to the option you choose if you wish to keep your staff working and not be vulnerable to becoming sick. Along your progression to complete the, "Beta Level," there will be some special events that occur among the staff members, including those that will lead some of your members in a state of confusion. If you wish to keep them on track if he/she is in a state of confusion, choose the 2nd option, and select which character needs help that are in a state of confusion. 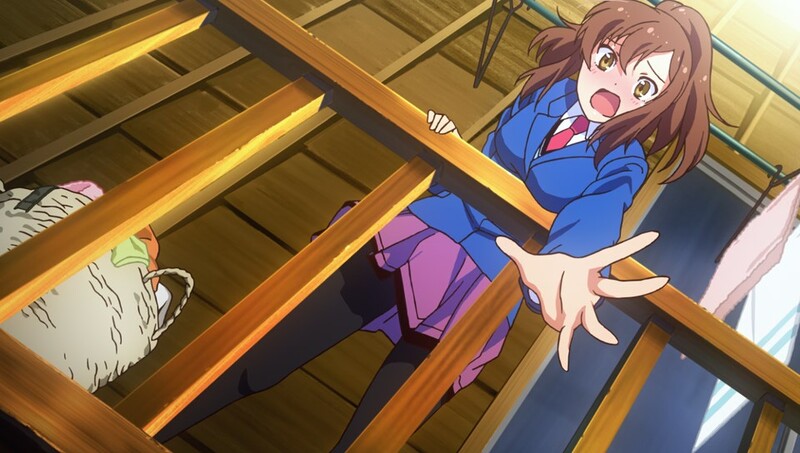 A CG art of Aoyama dropping a particular item down from the 2nd floor balcony. It's part of a special event that occurs from time to time in the game. This is triggered by a random event or choosing the 3rd option when you choose your selection. Otoha will temporarily cease working. 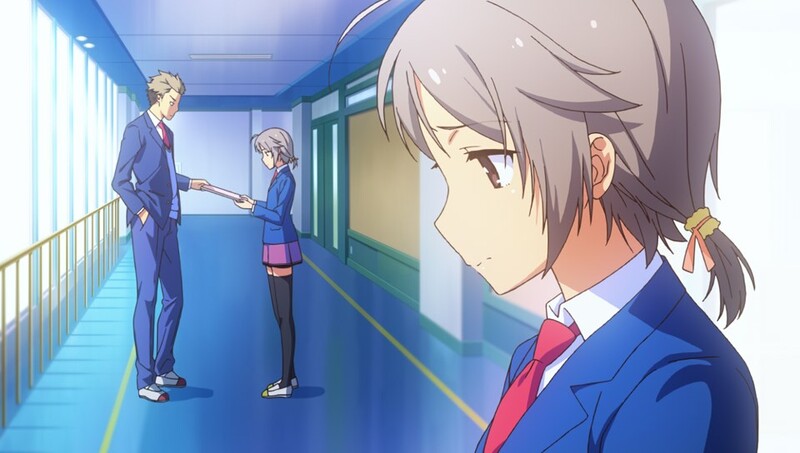 While you continue working and keeping all of your staff member's hope high, Otoha Nakano will eventually leave the group for a few days, after talking with, "Koichi Shinagawa." Her work will eventually be halted and left with 5 other members working on ahead. She explains later that she has had a "mental breakdown," after her meeting with Shinagawa. Best advice if this will happen is to not cram her with a lot of tasks to complete. Otherwise, you may not be able to have her research the "Red Star" task if everyone has it done except for her. 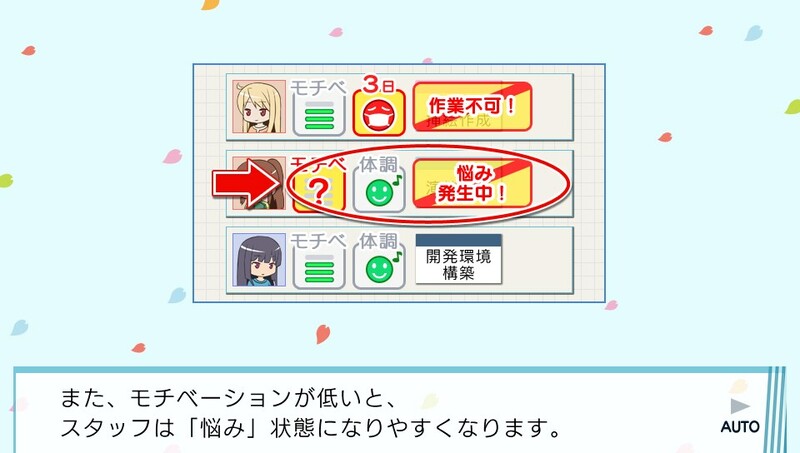 If you are really worried about Otoha falling behind once she comes back, try to get her motivation bars to 4. Otoha's flashback when she encounters Koichi Shinagawa. 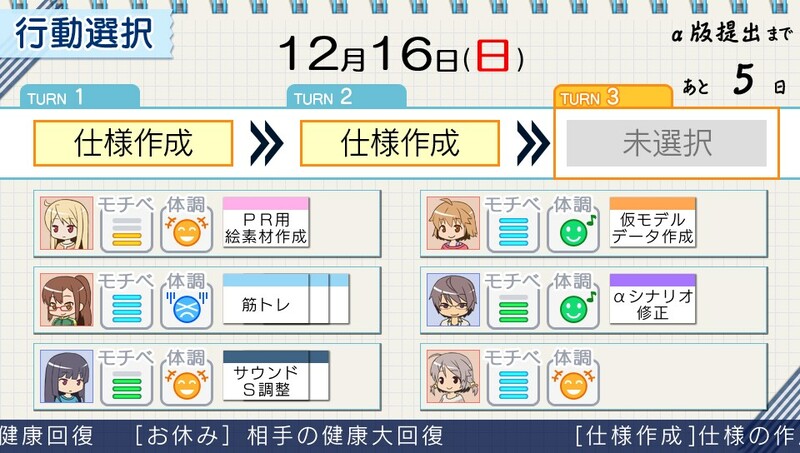 New Years in Sakurasou HAS a selection the player must make. There are 4 choices to choose when shown. The first option is that you care all about yourself being successful. The second option is having everyone become successful. The third option is that you care about Aoyama, and also how you want to stay by her side forever. 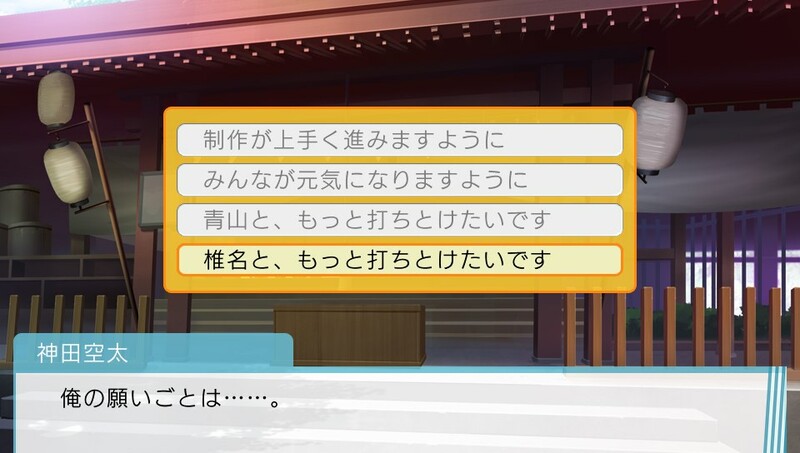 And the forth option, much similar to choice 3, is that you care about Shiina, and also how you want to stay by her side forever. One of these choice will have a huge impact for the overall gameplay. Maybe it might lead to an event where you confess your feelings to Shiina or Aoyama! Just choose wisely for this part. If you want to try completing the whole game without the Master Guide, be my guest! This is just a reference and recommendations if you are confused or stuck on the game.